I was sitting upright in bed while revising “A Hunger for Men’s Eyes,” one of the most vulnerable essays that I’ve ever written, a page-upon-page admission within a chapter in my debut essay collection, This Will Be My Undoing. My eyes scrutinized each word that peeled away my neuroses surrounding men, dating, and sexuality. My editor’s extensive notes exhausted me and the Google document for it kept freezing each time I moved my blinker further down in the narrative. Once I was finished, I walked into my bathroom and sat on the toilet while absentmindedly staring at the adjacent wall. Suddenly, a sadness overtook me. I’m not entirely sure if "sadness" is the correct word to describe what I experienced alone in the bathroom of my small Manhattan studio that evening. "Melancholy" sounds too delicate when I silently pronounce it. "Anguish" is heavier and therefore much more appropriate. I was anguished by what I had done and how much I revealed. Deep down, I had to go there, but when you have to travel psychologically to a place where you have never gone, even with editorial assistance, it can fling you into a dark place. In that moment — seconds, minutes, I cannot tell — I wanted to disappear. I wanted that anguish to swallow me whole. I knew I didn’t want to die, especially when I have so much to live for, but I was not sure how I could continue to go on after such exposure. When I decided three years ago that I would write for the public, I told myself that while I may not be the best writer, I would work as hard or harder than the best writers out there. I strove to be prolific, have impact, and most of all, to write with relentless honesty. I began my professional career at a time when editors of umpteen digital media publications were hungry for personal essays, and I took advantage of those opportunities. When you publish online, you're lucky if readers are sharing and discussing your work after several hours. That’s how quickly the Internet moves. But a book is different. The reader has more of an investment in it because the book was paid for. They can read it anywhere, and that expansiveness allows for you to be more explorative than online. While I was writing This Will Be My Undoing, there were certain personal admissions that blew me away, but it was when I approached the final stage that the process became the most real. Anyone could make any assumption they wanted about me and there was nothing that I could do about it. I worried more about whom I’d turn off instead of focusing on whom I might draw near. I thought that I had momentarily lost something somewhere, that I had become irreversibly undone. I have told my readers before that I cannot promise them pretty. In other words, I can ensure aesthetically clean sentences with the help of an editor, but I cannot promise them pretty opinions or, in the case of personal essays, memories. If I endeavored to compose my work of pretty memories, then I would be lying to myself as well as to my audience. The catch is that no one prepares you for what happens when you unearth those memories, those recollections that you wouldn’t even repeat to yourself underneath your bed sheets in the deep of the evening. Finishing the final draft of my book should have been an ecstatic moment. I did feel this emotion eventually, but not as soon as I'd thought I would. That evening, I thought that I had momentarily lost something somewhere, that I had become irreversibly undone. I perceived that the bathroom was tilted, my entire balance off-kilter. When I finally regained some kind of order, I called one of my closest friends in the city, an aspiring art curator with a penchant for astrology. After I recounted what happened to me in the bathroom, she took a beat and replied, “Morgan, you were mourning your former selves. That’s exactly what that was. You were mourning your former selves.” As soon as she told me this, I began to cry. With a trembling voice, I admitted that she was right — I was in fact in mourning for the past Morgans whose lives I detailed in my book. When I think about the Morgan in "A Hunger for Men's Eyes" who wanted so badly to be loved, or the Morgan who wanted to be white, or beautiful, or accepted, or all of the above at once in various chapters, it was their anguish that overtook me. But in the midst of that mourning, despite that heaviness in my chest, I could not believe that I survived those previous lives. So when I finished looking over my final draft, perhaps I could feel those former selves pulsating inside of my spirit. They lay dormant because I am constantly maturing; however, when I wrote down their (our) stories, I summoned them. They awakened and I was overwhelmed by how present they were. It is often said that when one chapter closes, another one begins. I have heard this phrase many times before, but I often wonder how much this holds for a writer, especially one who is performing a confession on the page. For me, the chapter never closes, although I may change and the people who are in my life in one particular season may not be there in the next. I don’t know what the chapter does exactly... Maybe it floats until summoned again. Maybe it hovers until that exact moment when a small yet noticeable characteristic in our presently quotidian lives makes us recall it. Or, maybe when it comes to confessing the chapters of our lives, time as we know it is disrupted. I have disturbed myself: this is how I know that I have accomplished something grand. I have unraveled a part of myself, and my emotional and physiological responses demonstrate that what I have written is not trivial. And therefore, the title seems fitting: This is (in fact) my undoing. Morgan Jerkins is the author of This Will Be My Undoing. Besides being an Associate Editor at Catapult, her work has been featured in The New Yorker, The New York Times, Rolling Stone, The Atlantic, Lenny Letter, and ELLE, among many others. One Response to "On Mourning Your Former Selves"
I just finished reading "This Will be my Undoing". I find it heartening and cosmic that a 62 year old white woman can find so much solace from the finely crafted and vividly honest words of a young black woman. Never to "compare" lives, only to realize, once again, that we are all one. The tragedy of patriarchy, slavery, racism, sexism etc makes us one. 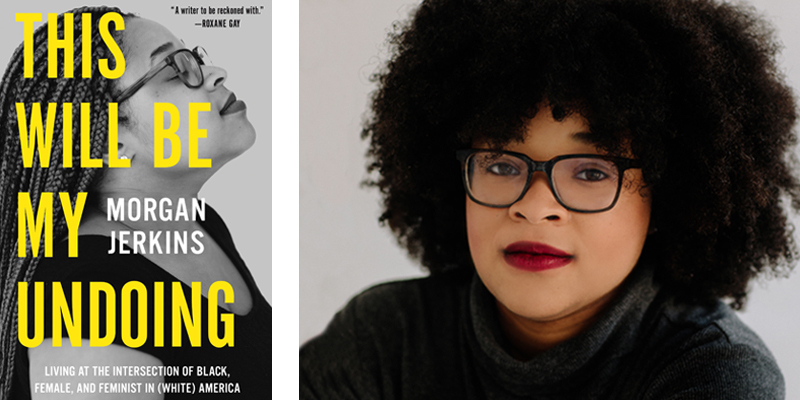 It takes an exceptional writer to create work which shows us how we are connected while still illuminating personal experiences important to understand across cultural and societal lines. Thank you Morgan.